A quick meeting with Gus and Harold revealed that what they really wanted was a programmer to code the Hille Modulated Receptor model so that they could estimate rate constants. Being an engineer of very little brain, I looked at the paper and could not understand it (either the Hille original model nor the Hondeghem-Katzung variant). The problem was that the model as described by Hondeghem and Katzung seemed over-determined - like fitting a unique straight line through a single point. 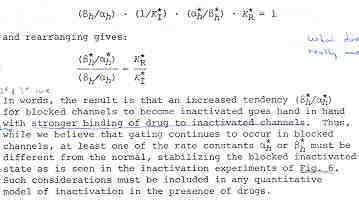 This was because Hondeghem proposed a shift in the "h" curve for inactivation of drug-complexed channels, and such a shift cannot be "identified" because it cannot be separated from a shift caused by voltage dependent blocking. Thus the MRH was initially not very interesting. Because of the ambiguity introduced in the MRH with shifted inactivation in drug-complexed channels, I made a counter proposal: lets simply use ordinary ligand-receptor binding kinetics applied to a linear reaction sequence (in contrast to a loop or cyclic reaction sequence) and see how many observations we can account for. 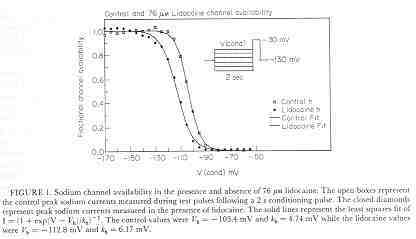 It turned out that by ignoring the altered gating in drug-complexed channels, it was possible to account for, with quantitative accuracy, use-dependent profiles, frequency-dependent profiles as well as shifted channel availability curves for all data that I was able to get my hands on (both published and unpublished). Thus, the birth of the guarded receptor model - which in reality was an extension of Clay Armstrong's linear model of TEA block of K channels. Our contribution was to derive equations that permitted almost trivial estimation of the rate constants. Further, Jay Yeh agreed to test the model and estimation procedure with QX222 during one of his Wood's Hole summers - and then Stan Nattel's group verified it and of course, a number of fellows in our lab (Rosey Gilliam, Doug Packer, David Wendt, Mike Barber, Yuri Zilberter, et al) also verified it. 1) Use-dependent and Frequency-dependent blockade requires an asymmetry of rate constants that shift the equilibrium toward and away from the Blocked state with changes in the membrane potential. Without this asymmetry, an equilibrium would be achieved after some time that would not vary with additional changes in transmembrane potential. 2) Blocking channels will increase shift more rest channels into the Inactivated state due to simple mass action. Consequently, at the rest potential where h is near 1, there can be significant tonic block, simply due to block of channels that are inactivated at the rest potential. In order to grasp the underlying simplicity of the above approach, I derive the main relationships for blockade of a periodically accessible (guarded) binding site. I start by reviewing binding to a continuously accessible site and then extending it to a periodically accessible binding site. 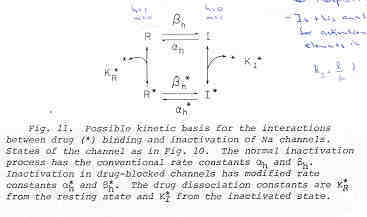 where 1-h is the fraction of channels with accessible binding sites and k and l are the rates of binding and unbinding respectively. The solution to this differential equation is exponential, as shown in the above figure. We show here, two stages of binding: 1) associated with the activation of the channel for 250 ms and 2) when the channel returns to the rest state. Here, the red curve depicts binding when all channels have accessible binding sites (activated state) while the green curve depicts binding (in this case, net unbinding) when no channels are accessible (h = 1). From this, its obvious that the membrane current just prior to stimulus transitions of a periodic piecewise exponential process follow an exponential sequence with a rate that is the linear function of the state-dependent rates and a steady-state that is a linear function of the state-dependent equilibria. These results, in fact, suggest experimental protocols for testing this model e.g. 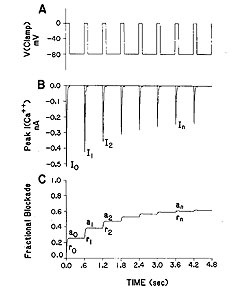 pulse train stimulation at different frequencies should yield a linear relationship between l and tr and another linear relationship between steady-state block and g. Rosey Gilliam verified this with studies of lidocaine block of cardiac sodium channels and Jay Yeh verified it with studies of QX222 block of squid Na channels. 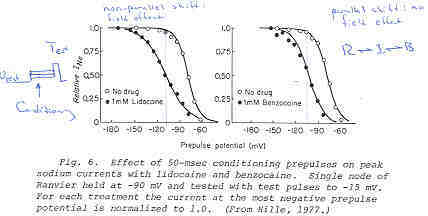 Here is a typical set of lidocaine blockade data demonstrating the frequency dependent effect: the higher the frequency of stimulation, the greater the blockade (from Rosey Gilliam's work). From these plots, the apparent rates of binding and unbinding can be estimated: la = ka[D] + la, lr = kr[D] + lr; a(inf) = ka[D]/( ka[D] + la) , r(inf) = kr[D]/( kr[D] + lr). For this example, we can assume a mean open time of 1 ms (ta) so that la = 714.9/s and lr = .102/s . ka[D] = a(inf) * la = .6873 * 714.9 = 491.3. Assuming [D] = 2 mM, then k = 2.45 x 105 /M/s and l = la - ka[D] = 714.9 - 491.3 = 223.6 /s . where g is a general "guard" function that describes the fraction of accessible channels and t is a general "trap" function that describes the fraction of blocked channels where the drug is trapped and cannot escape. This scheme is readily described by . In the case of block of inactivated channels, g = (1-h); for open channel block, g = m3h, assuming the Hodgkin-Huxley channel formalism. 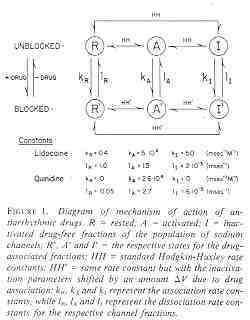 To incorporate the drug model into a standard description of an excitable membrane (HH, Lou-Rudy, Beeler-Reuter), its only necessary to add the blockade differential equation and modify the conductance of the channel being blocked. For the standard HH Na model, we write gNa = gbarNa*m3h(1-b) where gbarNa is the maximum Na conductance.